Rode the Fixation as a 69er and fixed with Katie on the Trail-a-bike for the first time. Hence the title, 29 inch wheel in the front, 26 inch drive wheel, and a 20 inch stoker wheel. Riding fixed this way was difficult when we hit some of the road crossings and then there is the matter of weight. I think Katie might be too big for the trail-a-bike because sudden jerks in the steering have us wagging all over the place. Still, it was worth some Daddy/Daughter time, two hours and 9 miles. Not the longest trip for us, I think we did 10 miles two years ago. This time we first headed back towards Southbury but after crossing Rte 188 the bridle trail got really sketchy and muddy and I didn't want to subject Katie to any more mud. We did hit a little puddle before and she got a little spray. We decided to wear our matching CTNEMBA Trail Ambassador jerseys and she actually fits into an XS pair of riding shorts from Cannondale and we were styling! We encountered a pair of horses on the trail and had to dismount and walk past them. It was a good ride with only one snack break. Riding this trail is tough, especially fixed, and pulling the trail-a-bike because there are some deep gravelly spots that slow you down immensely. The profile shot would look better if I didn't stop the Edge and forget to turn it back on again. 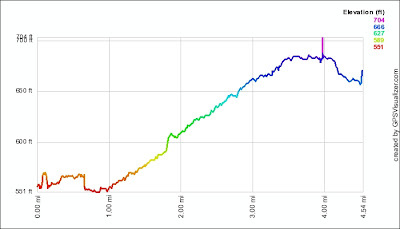 Still, this that is a pretty steady climb for a Steam Engine, after all the Larkin Bridle Trail is really the old railroad bed that connected Hawleyville and Waterbury. Below is a map from the link above. I want to try and do the whole trail sometime, only not pulling any kids. 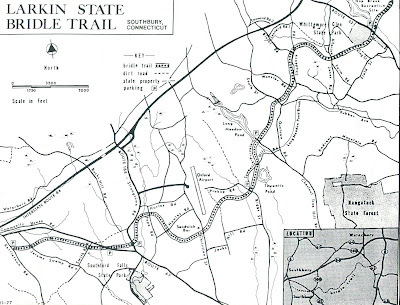 The entire trail is 10.3 miles and you could probably work in a loop at Hop Brook State Park and probably get 25 to 30 mile ride!